We love with chorizo & cheese, perfect!. The crowd pleaser of olive mixes. 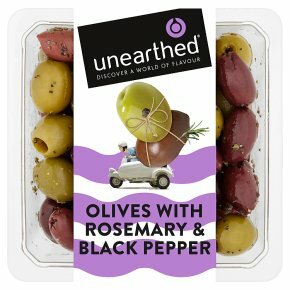 Suitable for vegetarians.Our Food Discoveries Olives with Rosemary & Black Pepper This is our most popular range of olives and always the first to be finished at parties. Rosemary and black pepper are said to work best with Italian olives, but we've discovered that it's actually their Greek cousins - the famous Kalamata olives from the Peloponnese, to be precise - that really come to life in this dressing. Warning: While every effort has been made to remove olive stones some may remain.